Sumpter Priddy is known for an innovative approach to the study of culture, with a particular focus on the artisans and artifacts of the pre-industrial South. His research seeks to identify and articulate the layered complexities regional life, and how Americans imbue objects with religious, emotional, and other cultural guideposts. He focuses on English and Scottish societies, and how their roots and traditions shape the dialogue and life of modern America. Priddy’s book American Fancy: Exuberance in the Arts (Milwaukee: The Chipstone Foundation, 2004) examines a previously unrecognized American cultural phenomenon and style. 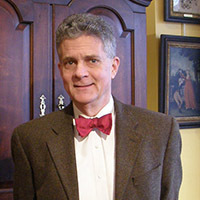 It won The Historic New England Book Prize for its “invaluable contribution to the study of American and New England Culture,” and was cited at the 2012 Winterthur Conference as “the sole paradigm shift in our field.” Priddy holds a BA in Architectural History from UVA and an MA in Early American Culture from Winterthur.